‘I didn’t do anything’ – I meant to say, but my mind was whirling, and I could not force the words out of my mouth. 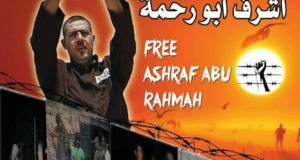 I participated in a demonstration on Road 443 two weeks before, and last Friday at a demonstration in Um Salamona (south of Bethlehem) on the day of its one-year anniversary. It seemed to me that in the three weeks between December 21st and January 11th, the military changed completely in Bil’in. During most of the demonstrations, wherever they were, I could sniff the smell of similar human bodies from the soldiers, and to be honest, I felt pity for them. They are much younger than me, and cannot even imagine the existence of an alternative to this violent, unproductive way of spending their weekend! On January 11th, they were much different. There was craziness at the demonstration that day, which I have never felt in the past three months, it was unbelievable and stressful. 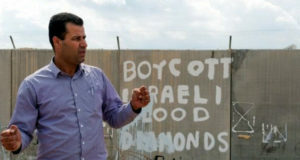 As I propped up one edge of a banner which read, “LEVIEV TURNS THESE ROCKS OF APARTHEID INTO DIAMONDS” I saw up close how one of the soldiers went mad, shouting “Anna Majnun! (I am crazy! )” while he pushed the demonstrators. This may have been in retaliation for villagers pretending “there’s a bomb!” near the soldiers, which surprised a few and provided a good joke for demonstrators, as the soldiers threw real sound bombs on the ground, just a meter away from participants. 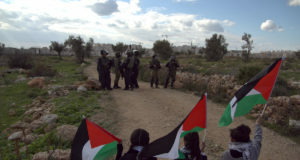 After 30 minutes of hard-fought struggle, nonviolent demonstrators retreated, and children started throwing stones. As I sensed (to my regret, mistakenly) ‘the end’ of the demonstration, I went back up the road to the ‘International House’ of the village, greeted some of friends, and caught a minibus going to Ramallah. When I saw inside the car, I was frightened, shocked, and at a loss for words. There was Adeeb, another villager, and Abdullah, whose head was bandaged and jeans stained with blood. Adeeb the other friend from the village, it seemed to me, looked natural, or tried to be calm. Or they may have tried their best to keep the atmosphere optimistic, to cheer Abdullah up. I was confused. ‘What happened? Why has this happened?’ I asked myself. Eventually I asked Adeeb, “Jeish? (soldiers? )” He said yes. In the middle of the road to the hospital, we came across an ambulance. Abdullah and another friend from the village rode in the ambulance while Adeeb and I remained on the minibus as we drove to a hospital in central Ramallah. I mildly cursed the fact that an ambulance does not make hardly any difference to a minibus in terms of arrival time. I imagined what I would do and say, if I were to be there. Could my presence really be able to deter violence against him? It is a question. One thing I imagined for sure is I would lose my temper, or as French people say, ‘losing my head’. I would also have to say one thing, and let me express the words in this space. “Why you are doing this? Why you are attacking such a nice person who struggles only for their land and peace with justice for all people?” I would ask the soldiers this if I were there. I would have to ask.